Citation: M.Vijayapriya, N.Anandh. (2015). Spatial-Temporal email Malware Propagation by using OLSR Protocol. 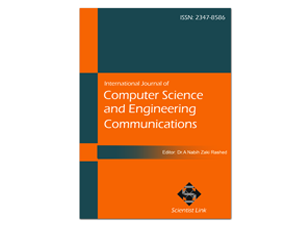 International Journal of Computer Science and Engineering Communications,Vol.3,Issue.2,pp.802-807. Email is a basic service for computer users. The technique of email-borne malware will be highly effective. Email malware focuses on modeling the propagation dynamics which is a fundamental technique for developing countermeasures to reduce email malware’s spreading speed and prevalence. Modern email malware exhibits two new features, reinjection and self-start. Reinjection is an infected user sends out malware copies whenever this user visits the malicious hyperlinks or attachments. Self-start refers to the behavior that malware starts to spread whenever compromised computers restart or certain files are visited. For address this problem, to derive a novel difference equation based analytical model by introducing a new concept of virtual dirty user. Propose a new analytical model to enhanced OLSR protocol which is a trust based technique to secure the OLSR nodes against the attack. The proposed solution called EOLSR is an enhancement of the basic OLSR routing protocol, which will be able to detect the presence of malicious nodes in the network. All the nodes are authenticated and can participate in communication. In our protocol is able to achieve routing security and increase the packet delivery ratio and reduction in packet loss rate. Malware short for malicious software is any software used to disrupt computer operation, gather sensitive information, or gain access to private computer systems. It can appear in the form of executable code, scripts, active content, and other software. With the escalating growth of communication and information systems, a new term and acronym invaded the digital world called as malware. It is a general term, which stands for malicious software and has many shapes (codes, scripts, active content and others). It has been designed to achieve some targets such as, collecting sensitive data, accessing private computer systems, even sometimes harming the systems. The malware can reach the systems in different ways and through multiple media; the most common way is the downloading process from the internet, once the malware finds its way to the systems, based on the functions of the malware the drama will begin. In  C.C. Zou, D. Towsley, and W. Gong et al presents for there an electronic mail worm imitation replica that the books for the behaviors of correspondence users, counting email examination time and the likelihood of aperture and communication superfluous. Our annotations of news item lists recommend that an Internet send arrangement follows a heavy-tailed allocation in stipulations of swelling degrees, and facsimile it as an influence law friendship. To modify the topological collision, we evaluate message larva broadcast on power law topology with maggot dissemination on two other topologies: small planet topology and accidental grid topology. C.C. Zou, D. Towsley, and W. Gong, “Modeling and Simulation Study of the Propagation and Defense of Internet E-Mail Worms,” IEEE Trans. Dependable and Secure Computing, vol. 4, no. 2, pp. 105-118, Apr.-June 2007. S. Wen, W. Zhou, Y. Wang, W. Zhou, and Y. Xiang, “Locating Defense Positions for Thwarting the Propagation of Topological Worms,” IEEE Comm. Letters, vol. 16, no. 4, pp. 560-563, Apr. 2012. Y. Wang, S. Wen, S. Cesare, W. Zhou, and Y. Xiang, “Eliminating Errors in Worm Propagation Models,” IEEE Comm. Letters, vol. 15, no. 9, pp. 1022-1024, Sept. 2011. S.M. Cheng, W.C. Ao, P.Y. Chen, and K.C. Chen, “On Modeling Malware Propagation in Generalized Social Networks,” IEEE Comm. Letters, vol. 15, no. 1, pp. 25-27, Jan. 2011. R. Thommes and M. Coates,“Epidemiological Modelling of PeertoPeer Viruses and Pollution,” Proc. IEEE INFOCOM ’06, pp. 1-12, 2006. M. Fossi and J. Blackbird, “Symantec Internet Security Threat Report 2010,” technical report Symantec Corporation, Mar. 2011. P. Wood and G. Egan, “Symantec Internet Security Threat Report 2011,” technical report, Symantec Corporation, Apr. 2012. Z. Chen and C. Ji, “Spatial-Temporal Modeling of Malware Propagation in Networks,” IEEE Trans. Neural Networks, vol. 16, no. 5, pp. 1291-1303, Sept. 2005. C. Gao, J. Liu, and N. Zhong, “Network Immunization and Virus Propagation in Email Networks: Experimental Evaluation and Analysis,” Knowledge and Information Systems, vol. 27, pp. 253-279, 2011. J. Xiong, “Act: Attachment Chain Tracing Scheme for Email Virus Detection and Control,” Proc. ACM Workshop Rapid Malcode (WORM ’04), pp. 11-22, 2004. S. Wen, W. Zhou, J. Zhang, Y. Xiang, W. Zhou, and W. Jia, “Modeling Propagation Dynamics of Social Network Worms,” IEEE Trans. Parallel and Distributed Systems, vol. 24, no. 8, pp. 1633- 1643, Aug. 2013. (1999) Cert, advisory ca-1999-04, Melissa Macro Virus, http:// www.cert.org/advisories/CA-1999-04.html, 2009. Cert, Advisory ca-2000-04, Love Letter Worm, http://www.cert.org/advisories/CA-2000-04.html, 2000. M. Calzarossa and E. Gelenbe, Performance Tools and Applications to Networked Systems: Revised Tutorial Lectures. Springer-Verlag, 2004. G. Serazzi and S. Zanero, “Computer Virus Propagation Models,” Proc. 11th IEEE/ACM Int’l Conf. Modeling, Analysis and Simulations of Computer and Telecomm. Systems (MASCOTS ’03), pp. 1-10, Oct. 2003.